He would never exercise - he was ​terribly ​lazy. او هیچ وقت ورزش نمی کرد، او خیلی تنبل بود. They exercise in the park every morning. Swimming is very good exercise. This exercise is good for your back. Please do exercises 1 and 2 for homework. Try to fit some regular exercise into your daily routine. Working in an office, I don’t get much exercise. Most people need to do more exercise. Gentle exercise can be beneficial for older people. After the operation, you should avoid strenuous exercise. You can do exercises to strengthen your stomach muscles. Do Exercises 3 and 4 on page 51 for homework. Buying a house can be an exercise in frustration. Half the unit was away on exercise. ▪ do some exercise (also take some exercise British English) He ought to do more exercise. | He was advised by the doctor to take more exercise. ▪ get some exercise I don’t get enough exercise. ▪ good exercise Swimming is very good exercise for your muscles. ▪ regular/daily exercise Taking regular exercise is the best way to improve your overall health. ▪ physical exercise Physical exercise keeps you fit and helps to reduce stress. ▪ hard/strenuous/vigorous exercise (=involving a lot of physical effort) Pregnant women should avoid strenuous exercise. ▪ gentle/light/moderate exercise (=not involving too much physical effort) Try to do some gentle exercise as part of your daily routine. ▪ aerobic exercise (=in which you breathe deeply and your heart beats faster) Aerobic exercise, such as jogging or cycling, is a great way to burn off fat. ▪ a type/form of exercise This type of exercise is excellent for losing weight. ▪ lack of exercise Children are becoming overweight through lack of exercise. ▪ an exercise programme/routine/regime British English, an exercise program American English (=a plan that includes different types of exercise) The athletes follow an intensive exercise programme. | I’m finding it quite hard to stick to my exercise routine. ▪ an exercise class I usually go to my exercise class on Wednesdays. ▪ do an exercise (also perform an exercise formal) Try to do these exercises at least three days a week. ▪ a basic exercise (=simple) He showed me some basic exercises for strengthening leg muscles. 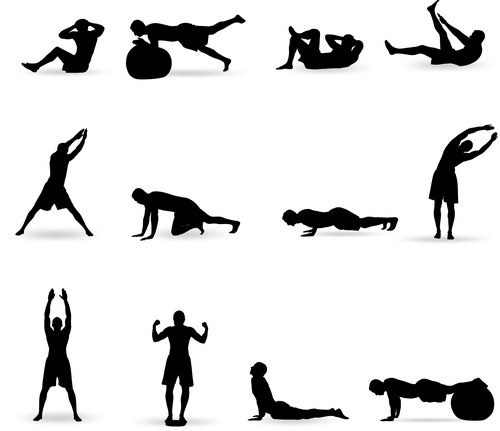 ▪ keep-fit exercises I couldn’t get to the gym, so I did a few keep-fit exercises in my bedroom. ▪ a warm-up exercise Do some warm-up exercises before lifting heavy weights. ▪ a yoga exercise Yoga exercises keep you supple. ▪ a breathing exercise We do breathing exercises in my yoga class. There are plans to encourage people to exercise their right to vote. People who can exercise some control over their surroundings feel less anxious. Swimming exercises all the major muscle groups. It’s an issue that’s exercised the minds of scientists for a long time. It was clear that Flavia had been exercised by this thought. ▪ exercise to walk, do sports etc in order to stay healthy and become stronger: To lose weight, exercise regularly and eat less. ▪ do some exercise/a lot of exercise etc this phrase is much more common than the verb exercise, and means the same thing: Her doctor said that she needed to do more exercise. | My son does very little exercise – I don’t know how he stays so slim. | Dogs need lots of exercise. ▪ stay/keep/get in shape to stay or to become physically healthy and strong – used especially when you consider exercise as a way to keep a nice-looking body: Try jogging with a friend who also wants to get in shape. ▪ keep fit British English to exercise regularly in order to stay healthy and strong: The class encourages older people to keep fit. ▪ work out to do exercise in order to be healthy and strong, especially to exercise regularly in a gym or exercise class: He works out three times a week. ▪ tone up (also firm up) to exercise in order to make your body or part of your body firmer: I need to tone up my stomach and legs. ▪ warm up to do gentle exercises to prepare your body for more active exercise: It’s important to warm up before you begin to play. ▪ stretch to reach your arms, legs, or body out to full length, in order to make your muscles as long as possible, so that you do not injure them when you exercise: Jog for five minutes, then stretch before starting on your run. ▪ limber up (also loosen up) to do gentle exercises so that your muscles are warm and not tight before you begin a more active exercise: The footballers were limbering up before a training session. ▪ train especially British English to prepare for a sporting event by exercising in a particular way: She’s training to do the London Marathon. ▪ practise British English, practice American English to do a sports activity regularly, in order to get better and prepare for competition: The team practices on Wednesdays and Saturdays. • Swimming is good exercise. • I don't get much exercise sitting in the office all day. • The mind needs exercise as well as the body. • Repeat the exercise ten times on each leg. • Do exercise one for homework. • In the end it proved a pointless exercise. • Staying calm was an exercise in self-control. The British are very fond of sport, but many people prefer to watch rather than take part. Many go to watch football, cricket, etc. at the ground, but many more sit at home and watch sport on television. Most people today take relatively little general exercise. Over the last 30 or 40 years lifestyles have changed considerably and many people now travel even the shortest distances by car or bus. Lack of exercise combined with eating too many fatty and sugary foods has meant that many people are becoming too fat. Experts are particularly concerned that children spend a lot of their free time watching television or playing computer games instead of being physically active. In recent years, however, there has been a growing interest in fitness among young adults and many belong to a sports club or gym. In Britain most towns have an amateur football and cricket team, and people also have opportunities to play sports such as tennis and golf. Older people may play bowls. Some people go regularly to a sports centre or leisure centre where there are facilities for playing badminton and squash, and also a swimming pool. Some sports centres arrange classes in aerobics, step and keep-fit. Some people work out (= train hard) regularly at a local gym and do weight training and circuit training. A few people do judo or other martial arts. Others go running or jogging in their local area. For enthusiastic runners there are opportunities to take part in long-distance runs, such as the London marathon. Other people keep themselves fit by walking or cycling. Many people go abroad on a skiing holiday each year and there are several dry slopes and snowdomes in Britain where they can practise. Membership of a sports club or gym can be expensive and not everyone can afford the subscription. Local sports centres are generally cheaper. Evening classes are also cheap and offer a wide variety of fitness activities ranging from yoga to jazz dancing. Some companies now provide sports facilities for their employees or contribute to the cost of joining a gym. Sports play an important part in American life. Professional baseball and football games attract large crowds, and many people watch games on television. Although many parents complain about their children being couch potatoes (= people who spend a lot of time watching television), there are sports sessions at school for all ages. College students are usually also required to take physical education classes to complete their studies. Many popular keep-fit activities began in the US. Charles Atlas, Arnold Schwarzenegger and others inspired people to take up bodybuilding (= strengthening and shaping the muscles). Many women joined the ‘fitness craze’ as a result of video workouts produced by stars such as Jane Fonda and Cindy Crawford which they could watch and take part in at home. New fitness books are continually being published and these create fashions for new types of exercise, such as wave aerobics, which is done in a swimming pool, and cardio kick-boxing, a form of aerobics which involves punching and kicking a punchbag. Many richer people employ their own personal trainer, either at home or at a fitness centre, to direct their exercise programme. Local YMCAs offer programmes which include aerobics, gym, running, weights, treadmills and rowing machines, as well as steam rooms and swimming. But many people just walk or jog in the local park or play informal games of baseball or football. • Do one exercise for homework. • Ask your students to try this exercise before the next class. • Before embarking on any exercise, you should conduct a cost-benefit analysis. • Combine yoga with stretching and floor exercises. • Do you take enough exercise? • Half the regiment was away on exercise. • He began his daily exercises. • I did try some basic relaxation exercises. • John never does any exercise. • Lack of exercise is a risk factor in heart disease. • Mental exercises can help older people to sustain their mental abilities. • Practise/Practice the following exercise at least twice a day. • Remember to do your breathing exercises every day. • Role-playing situations allows a finer assessment to be made than in pen and paper exercises. • She recommends the following exercises to increase circulation. • Stop frequently to rest during exercise until you are fitter. • The Government instituted a massive exercise in social control. • The company has just carried out a major cost-cutting exercise. • The doctor recommended regular exercise. • The object of the exercise is to increase public awareness of environmental issues. • The seminar was a valuable exercise in information exchange. • The troops go on exercises twice a year. • The whole consultation process was just a cynical political exercise. • They recently completed a four-week exercise in Poland. • This is a great exercise for the upper back. • This is not a purely academic exercise: it should have a real impact on the way we work as a department. • Try to do fifteen minutes of gentle exercise every day. • US forces took part in joint exercises with the British Navy. • We have conducted training exercises in seven separate states. • We run team-building exercises with employees at each office. • We were out on a field exercise. • Weight-bearing exercise increases the health of bones. • You can devise your own exercises to music. • You may find it helpful to perform this exercise in front of the mirror. • You will complete these exercises for homework. • As a public relations exercise the festival was clearly a success. • One of these powers is the exercise of discretion by police officers. • Remember to take regular exercise. • Sovereignty means more than just the exercise of power. • When she appeared in court she exercised her right to remain silent. • He was a man who exercised considerable influence over people. • How often do you exercise? • ~ sth Horses need to be exercised regularly. • These movements will exercise your arms and shoulders. • The public are less exercised about this matter than the media. • This very problem has exercised the minds of some of our most eminent scientists. Exercise or work out? Exercise can be any type of physical activity; working out usually involves using equipment in a gym. • Each of us has a vote— if we choose to exercise it. • It is necessary to exercise caution when making recommendations. • Managers are free to exercise their discretion in these cases. • The all-powerful steering committee continued to exercise control. • The company's representative failed to exercise due care. • They found themselves unable to exercise influence and maintain independence. • They have the right to exercise self-determination. • Care must be exercised to ensure there is no cross-contamination between samples. • I've just done an hour's class of exercising to music. I exercised my democratic right by not voting in the election. Always exercise caution when handling radioactive substances. We've decided to exercise the option (= use the part of a legal agreement) to buy the house we now lease. The exercise of (= use of) restraint may well be difficult. Ships from eight navies will be taking part in an exercise in the Pacific to improve their efficiency in combat. It would be a useful exercise for you to say the speech aloud several times. The book has exercises at the end of every chapter. I do stomach exercises most days. A work-out in the gym will exercise all the major muscle groups. Now he's retired he spends most afternoons exercising his dogs. Britain has warned travellers to exercise prudence and care. Exercise is also a noun. When you exercise, you move your body energetically in order to get fit and to remain healthy. Exercising the body does a great deal to improve one’s health. If a movement or activity exercises a part of your body, it keeps it strong, healthy, or in good condition. Exercises are a series of movements or actions which you do in order to get fit, remain healthy, or practise for a particular physical activity. Exercises are military activities and operations which are not part of a real war, but which allow the armed forces to practise for a real war. An exercise is a short activity or piece of work that you do, for example in school, which is designed to help you learn a particular skill. If you describe an activity as an exercise in a particular quality or result, you mean that it has that quality or result, especially when it was not intended to have it. Think what a waste of taxpayers’ money the whole exercise was. If something exercises you or your mind, you think or talk about it a great deal, especially because you are worried or concerned about it.